Get An Experienced Local Handyman! So, all you have to do is get in touch with us today on 020 3404 5950 and we will help you find solutions for your property maintenance needs. Benefit from professional and prompt assistance! from fixing the curtain pole, track or rail to hanging the drapes and curtains, any room looks elegant with accessorised windows. 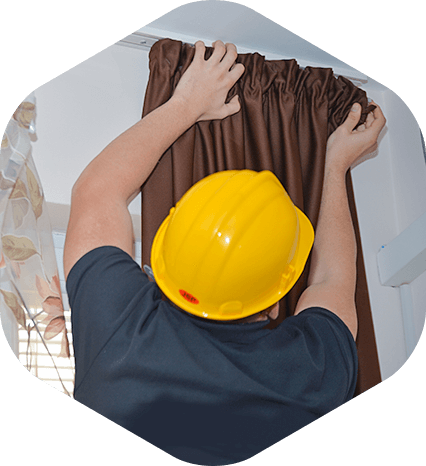 whatever usage and style you want, the expert blind fitters can help you with a hassle-free installation. fitting bathroom mirrors on vanities or entire mirrored walls, we’ll help you see yourself again. for the best viewing experience, you’ll need the skill and tools of the seasoned handymen so you can lay back and fully enjoy your flatscreen. even if it’s just a single piece of art or an elaborate grid, we’ll make it perfectly levelled and appealing. In case you do not notice a particular service or procedure you are interested in, please consult with our friendly customer care staff for additional information. at prices that are hard to beat. From Monday to Saturday, the charge for the first half hour of work is £34 (£39 on Sundays). After this, every subsequent half hour is charged with £27 (£32 after 6 pm & On Sundays). In case you want to take advantage of up to 20% discount on all Services we offer, ask for our Loyalty Club membership. Minimum per appointment is 1 hour. For the full breakdown of our rates, check out our prices page. Keep in mind that if you have booked a tradesman for 2 hours but he is finished with the job in just one, you will only pay for the actual time it took him to complete the service. Also, take into account that our schedule is usually pretty packed and the technicians aim to be as efficient as possible. Our call centre operators are at your disposal 24/7, so should you need any further assistance you can reach out to them. Q: I need help ASAP, can you come today? A: A same-day service can be arranged if our schedule allows it so just contact us and we might be able to help you. Q: How much time the service will take? A: Well, this depends on the scale and complexity of the tasks that need to be performed. But to give you some kind of reference, browse our service pages and you'll be able to find time estimates for some of them. A: Yes, the technicians are insured so we are covered. A: Currently we are able to provide services within the M25 London zone. Q: Do you guarantee the high-quality of your services? A: Yes, absolutely! The handymen are experienced tradesmen who work with diligence and dedication. They would never compromise the quality of their work. You can use our convenient request a service form to quickly arrange your handyman service. It will only take a few moments. And as for our live chat, simply type in your query and you will receive an instant reply and all the information you need, whenever you need it!. You can always opt to simply give us a call. Our friendly customer care staff will happy to answer all your questions and put you on schedule.